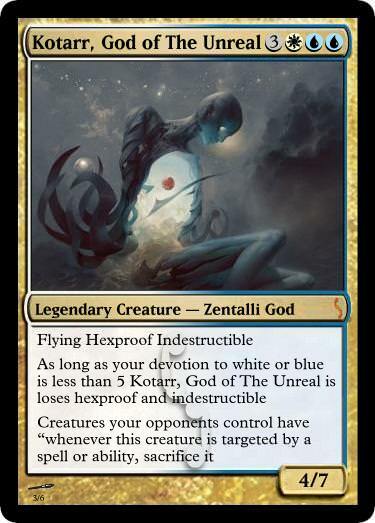 My fourth god. This competition is pretty awesome. 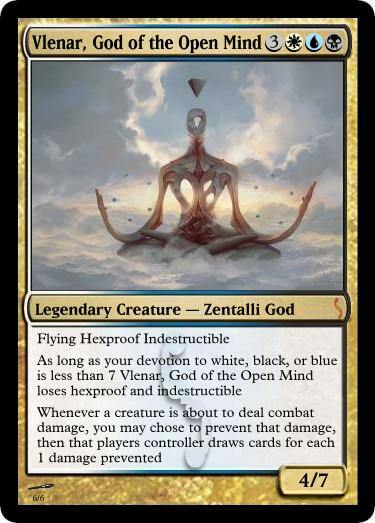 Amonkhet gods don't have creature types other than god, which is a real shame in my opinion. 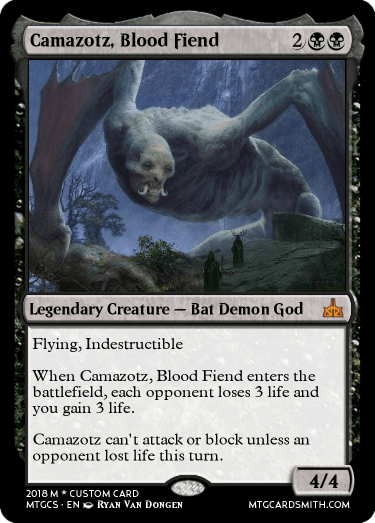 Camazotz here has three creature types! This is for a new creature type I created, called Scurriers. They are other types of creatures that have been transformed into evolving machinations, part living, and part machine. 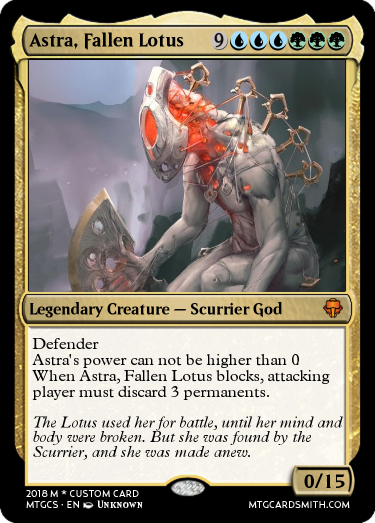 They have a long list of deities, mostly much older Scurriers transformed from ancient civilizations. @WickedShadow196 What did you use to make that card? It looks really cool. @ChaosStar search up "mtg design" or click on Agni and it gives you the link. You just have to delete everything after the / after design. @WickedShadow196 Thanks a lot! The website looks great, and I made a couple cards, but I couldn't find any way to edit pictures and a few had parts out of frame. How do I fix that? @ChaosStar If the picture is out of place from the border I save the picture then edit it with paint to take a screen shot with a little space below the picture. Then I used Pinterest to pin the screenshot and using the pins url to use for the artwork until it is fixed. Also sometimes might need to crop the sides. Warning I do not think the cards save though so you might want to download them. The limit for entries right now is five, and I will have prizes for the 1st, 2nd, and 3rd place finishers. I might do some runner-up prizes to. Great entries so far, keep up the good work. 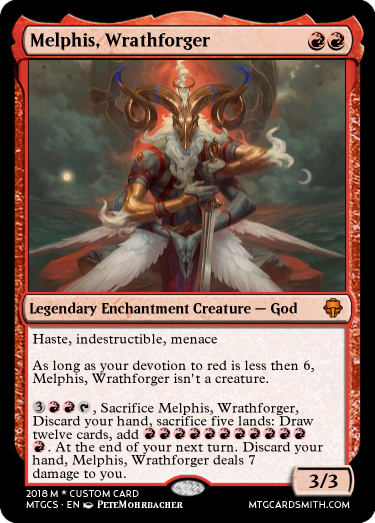 Also, go check out my Rise of the Gods set on MTG Card Smith. Rise of the Gods is not fully furnished yet. 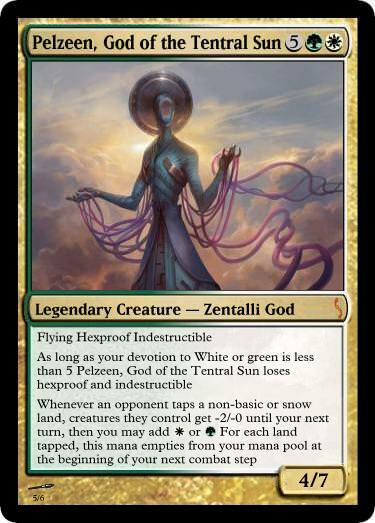 I am trying to make the gods as accurate as possible so there might be some revisions. I'll have to go check that out sounds pretty sweet a rise of the gods set? Yes please. Question. 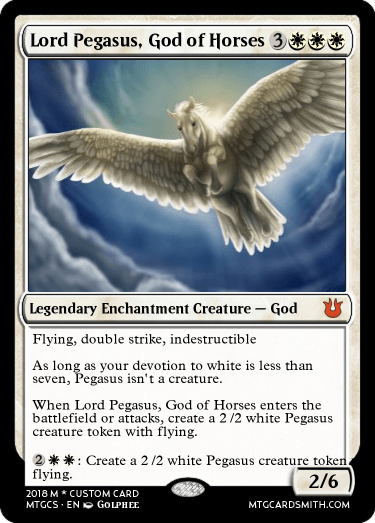 I'm wondering whether my next bunch of gods should be Babylonian or Norse. I all ready have three Norse gods but am not sure which group to do next. Hmm... How about your own made up God's? That's a good idea. Maybe i'll work on both. 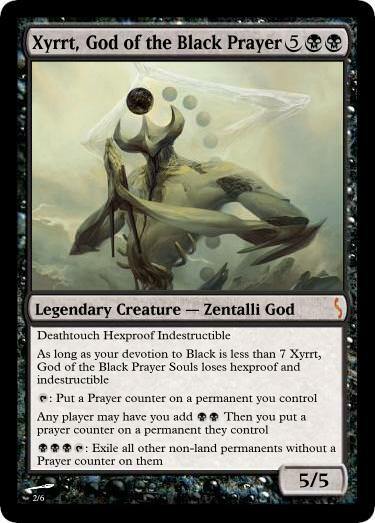 Yeah, you could have your own made up gods, then guest appearances by actual already created gods to add to the story. I wonder. 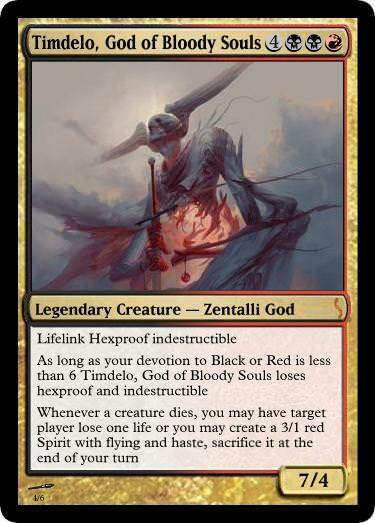 Did you mean to put Sacrifice in there or did you forget that he has Indestructible. You can sacrifice or exile indestructible stuff. For those who don't know, he was a god. Kind of. Ok, some feedback please. I'm thinking about judging sometime in September. Is this good for you guys or is it to early. Also, I'm thinking of another idea for a contest. 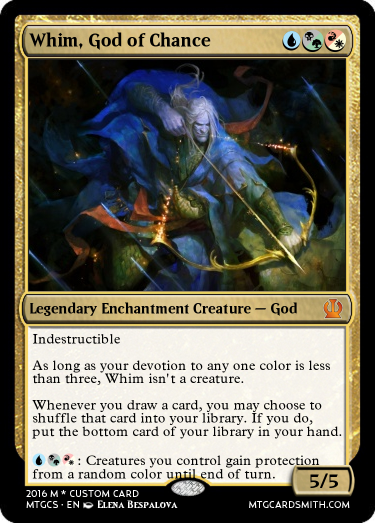 Its Spells that have something to do with Embalm and Eternalize. Sound good? Mummies and Eternals will also be accepted. If you can't tell, I love undead, especially Mummies and Eternals.